Upload quality photos of your landscape. All photos need to be JPEG format (common format from phones and digital cameras). Include at least one overall, wide-angle “curb appeal” shot as viewed from the street. Provide before and after images. Please notify us if this is not possible. Tell us why you elected to install a WaterSmart landscape – the design and installation process and any unexpected benefits. We want to hear your story! List the water-wise plants in your landscape. Describe your watering system as best you can. Visit our Tips section to learn how to improve your chances of winning. Submit approximately 10 of your best photos of your WaterSmart landscape (max file size 3MB/ea.). Include overall views, street views and if possible, 2 - 3 before and after photos. Avoid low quality or distracting photos. This is where you get to show off your hard work! List any efficiency improvements like drip irrigation, high efficiency spray nozzles, smart controllers, rainwater catchment, gray-water systems, or other irrigation methods. I authorize publication of photographs I have submitted (or those taken by others) of my landscape, and my name for the purpose of promoting water efficiency programs. Your local water agency will not publish the address of any participant without the account owner's consent. Download the paper entry form by clicking on the image below to open a PDF in your browser. Then, either fill in the requested information on your computer (right on the PDF form) or download, print, and clearly write your answers. Gather photos of your landscape. Write your name and property address on the back of each photo (photos will not be returned). 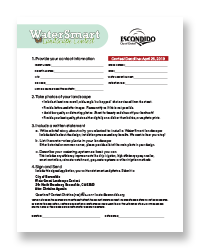 Provide a written explanation of why you elected to install a WaterSmart landscape. Include a list of the water-wise plants in your landscape and details about your water system and schedule. Contact Christina Agustin (760) 839-4077 | water@escondido.org if you have questions or if you have not received confirmation that your entry form and all photos were received.